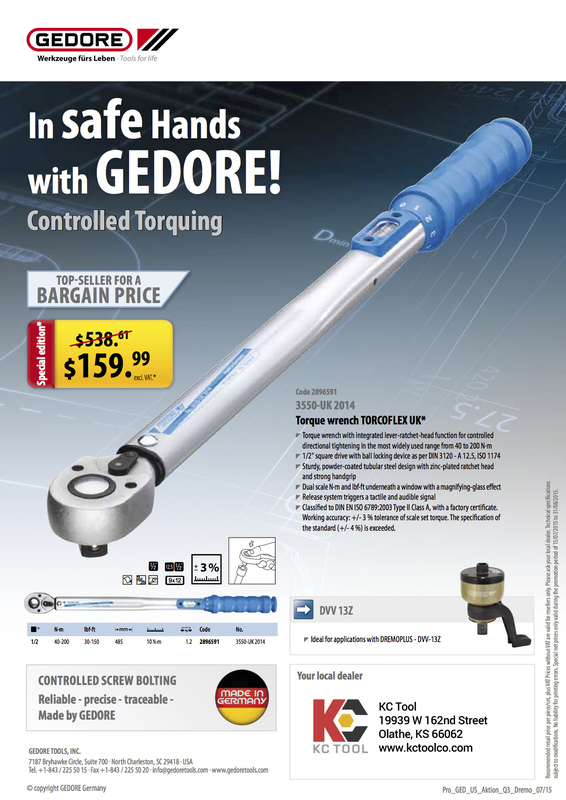 Save over 70% off the list price of this 1/2″ drive Gedore torque wrench from now until October 31, 2015. This torque wrench has a range of 30 – 150 ft-lbs (40-200 Nm) and has a working accuracy of +/- 3%. It also features a powder-coated tubular steel design with a zinc-plated ratchet head and comfortable hand grip. Each wrench comes with a factory certificate of calibration. GEDORE brand torque control tools are warranted for twelve (12) months from date of purchase and up to 5,000 torque cycles (where after GEDORE recommends re-calibration). Consumable Products are warranted only against defects in workmanship or materials that prevent their use. For purposes of this Warranty, Consumable Products are defined as those Products which are reasonably expected to be used up or damaged during use, including without limitation drill bits, saw and knife blades, grinding and sanding discs, knife blades, files, sensors and batteries. This Warranty extends only to the original Customer and may not be transferred or assigned to any third party.